Full 8spd XT, Judy FSX, etc... Sweet! 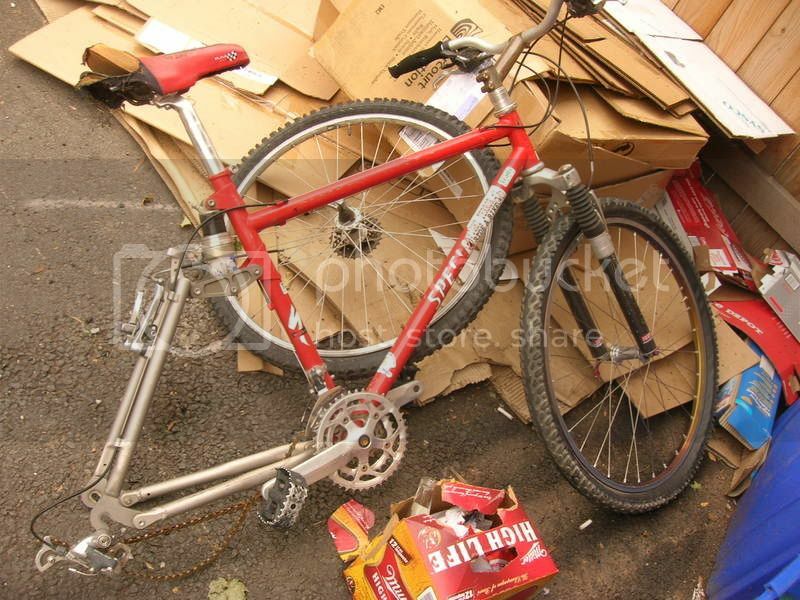 actually while we're on the subject, anybody know what the rules are about nice bikes left at tips/dumps/civic amenties (not those left in a skip I mean)? or does it vary by area? If I saw a nice bike just sat there, could I make an offer for it or aren't they allowed to do that? Or in your experience if you slip them Â£50 do they just let you have it? I believe the rules vary by local council - we used to go to one in Dorset where they'd sell you anything for a fiver or so. In contrast, the one near my parents in Berkshire isn't allowed to sell you anything (and it automatically becomes property of the council once someone places it on the ground and walks away). However, I'm pretty sure in the latter case Â£20 would convince them to look the other way whilst you recycled their waste. As regards the bike above, well done. What always confuses me is how these people were obviously into cycling only X number of years ago, and yet now think it's worth nothing. Looks like the chain needs some oil You can always tell how well society is doing. In boom times people trash every thing. In down times they keep every thing and make it last. This expensive luxury item has just been trashed. It could have been given to some one more needy but couldn't afford a bike. Such a sad indictment of modern society. Well, or perhaps a sad indictment of Durango? Harsh, but you might be on to something. Last night I saw some dude riding around on a 2004 Trek Carbon Top Fuel... full XTR, discs, etc. It was completely covered in beer stickers and it was obviously this guy's pub bike. F'n ridiculous. Its all the kids who come to the college with parents' cash and trust funds, etc. In another instance, I saw a Moots left on some porch unlocked for weeks. Rusty chain, flat pedals, etc. can i touch you? it might help me find these damn cantis i'm after. You're absolutely right, its raining retro bikes and parts - utterly useless bikes and parts! Dont get me wrong, I'm very thankful, but a bin full of Mobys isn't all that cool unless I've got the bikes to put them on. Still searching for that small Yo! (newer one 95-99).